Americans are thought to consume 1.2 billion pounds of potato chips per year, with each person consuming an average of 110-120 pounds of potatoes. According to the Snack Food Association that translates to spending $7 billion annually on potato chips. From the beginning Americans have been in love with the potato, which is grown in all 50 states. According to traditional story, the original potato chip was created in Saratoga Springs, New York in 1853, by Geaorge Crum. In the 20th century these chips began to be mass-produced for home consumption. Founded in 1910, in the backyard of Apache's Cincinnati, Ohio production facility − Mike-Sells Potato Chip Company is believed to be the oldest potato chip company in the US. In Western countries potato chips are a predominant part of the snack food market, with the global potato chip market generating total revenues of $16.49 billion in the US in 2005. This accounted for 35.5% of the $46.1 billion total savory snacks market in that year. 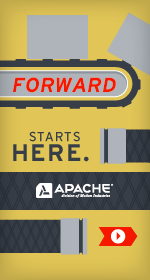 Apache offers a variety of flat black rubber and PVC belting, profiled top covers, and cleated belts for harvesters, transporters, collectors, conveyors, pilers and scoops. Once in the processing facility, the potatoes move throughout the building on a variety of belts. Other types of snack chips go through a similar production process, including Ritz, Lays, Doritos, Fritos, and Orville Redenbacher − five of the top-selling snack brands of 2013. Some OEMs of the form fill and seal conveyor are Hayssen, Woodman-Klicklok, Rovema, Bosch, and Matrix.